“It was the books that did it,” said Darrin Crescenzi. More specifically, it was the insignia on the warplanes in the pictures in the books that were always open as his father painted. 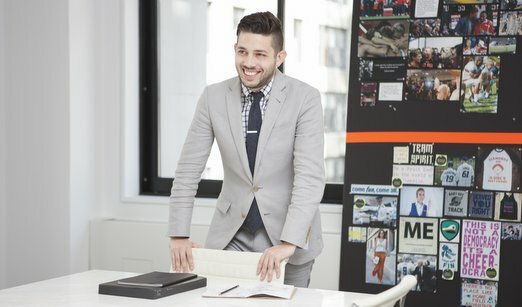 They triggered a fascination in the boy who would one day — not quite six years after graduating from OSU in 2007 with a bachelor’s in applied visual arts — be recognized as one of the world’s 100 most creative people in business. Jack Crescenzi was a wellknown aviation artist who lived in Bend with his wife Bobbi, their son Darrin and one of Darrin’s half sisters. He specialized in photorealistic aerial combat scenes. Young Darrin spent hours comparing and trying to reproduce the markings on the airplanes. “I became obsessed with flags, with the insignia, with with what I didn’t know was branding at the time,” Darrin said. “It’s the thing on the side of the plane that says ‘I am Japan. I am Germany. I am the United States.’ Simple shapes and primary colors — things a three-year-old can understand. How does a series of concentric circles on the side of a plane represent England? It’s totally absurd, but as a kid I got it. It made sense to me. “I didn’t know how to talk about it and I certainly didn’t know how it might apply to the commercial world, but it was branding, and it definitely planted the seed for what I do now.” What Crescenzi does now is serve as senior designer in the Manhattan offices of Prophet, a worldwide brand and marketing consultancy, where he was hired last year. Before that — first as a student intern and then as a professional after leaving OSU — he designed for Nike in Beaverton, working on projects ranging from wallpaper in the Nike athletes’ lounge at the Beijing Olympics to the initials-and-crown personal logo of NBA superstar LeBron James to the uniforms the American men’s Olympic basketball team wore in London in 2012. That and other work — most notably a wildly popular poster he produced just for fun of the sigils (family seals) he’d imagined for the fictional Houses of Westeros in the book and TV hit “Game of Thrones” — got him noticed by the arbiters of design excellence at the influential magazine Fast Company.This year, when the magazine released its closely watched annual list of the 100 most creative people in business in the world, right there at number 37 was the fast-rising designer from Oregon — still and always an Oregon Stater who speaks with pride of OSU’s land grant heritage and its get-to-work attitude. Learn more about Crescenzi's journey in the fall 2013 issue of the Oregon Stater. Jack Crescenzi was a well known aviation artist who lived in Bend with his wife Bobbi, their son Darrin and one of Darrin’s half sisters. He specialized in photorealistic aerial combat scenes. Young Darrin spent hours comparing and trying to reproduce the markings on the airplanes. What Crescenzi does now is serve as senior designer in the Manhattan offices of Prophet, a worldwide brand and marketing consultancy, where he was hired last year. Before that — first as a student intern and then as a professional after leaving OSU — he designed for Nike in Beaverton, working on projects ranging from wallpaper in the Nike athletes’ lounge at the Beijing Olympics to the initials-and-crown personal logo of NBA superstar LeBron James to the uniforms the American men’s Olympic basketball team wore in London in 2012. That and other work — most notably a wildly popular poster he produced just for fun of the sigils (family seals) he’d imagined for the fictional Houses of Westeros in the book and TV hit “Game of Thrones” — got him noticed by the arbiters of design excellence at the influential magazine Fast Company. This year, when the magazine released its closely watched annual list of the 100 most creative people in business in the world, right there at number 37 was the fast-rising designer from Oregon — still and always an Oregon Stater who speaks with pride of OSU’s land grant heritage and its get-to-work attitude.